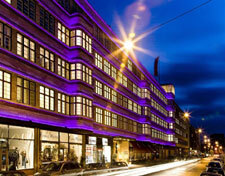 The Ellington Hotel, with its central location between the "Ku�damm", the zoo and the KaDeWe department store, is the perfect address for your stylish Berlin visit. Elegance and quality in a very special atmosphere await you in the listed building, erected in the "Golden Twenties". The 285 rooms of the design hotel are divided into modern single and double rooms in various categories, different suites through to the tower suites with a breathtaking view over the roofs of Berlin, to the Kaiser-Wilhelm-Ged�chtnis Church. In the Ellington we let you have a lie-in - free late check-out on Sundays!